H1Z1 is finally coming out of early access. After three years, Daybreak’s survival game, which helped spawn the huge success of the battle royale genre, will hit is 1.0 release. H1Z1’s Auto Royale attempts a drive-by on PUBG and Fortnite. The update, which drops today, introduces a new feature, Tactical Deployment, which allows players to decide where they want to drop on H1Z1’s King of the Kill maps. Pre-game lobbies will now show a heatmap showing where other players are choosing to drop, allowing you to dive into the fray, or tactically skirt around the fighting until later in the game. Daybreak are also testing the idea of allowing players to see the bounds of the first zone, letting them decide whether they want to guarantee safety earlier, or work their way into the zone from the outside. The update will also see the launch of the first official season for H1Z1. In an interview with PCGamesN, the game’s general manager, Anthony Castoro, said that the season would include a new scoring algorithm. Getting into the top ten is still “a big factor in your score,” but now you’ll have to make sure you can keep up those high-scoring games. Players can now rank down if they start to play in a way that sees their number of kills go down – it’s not enough to simply survive until you reach the latter stages of the game – to succeed, you’ll have to leave a trail of bodies in your wake. The update will also include the arrival of the new game’s new Auto Royale mode. 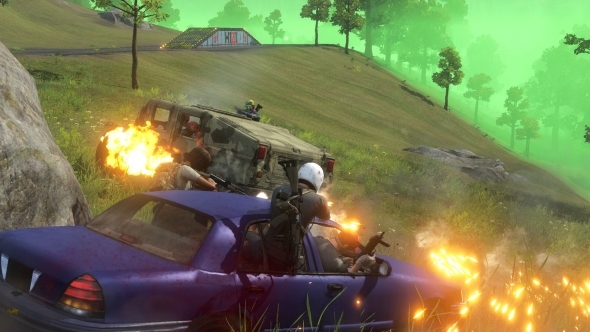 Built for squads of four players, Castoro describes the new vehicle-based battle royale as an “action-arcadey” take on the genre. Players can spawn into different kinds of vehicles, before racing around the map, picking up powerups like oil slicks and landmines, and shooting the ever-loving christ out of each other’s vehicles, as you might expect from a battle royale. H1Z1’s full release drops today, including everything mentioned above, available for free to players.